Electron microscopy uses a beam of electrons as an energy source. An electron beam has an exceptionally short wavelength and can hit most objects in its path, increasing the resolution of the final image captured. The electron beam is designed to travel in a vacuum to limit interference by air molecules. Magnets are used to focus the electrons on the object viewed. There are two types of electron microscopes. 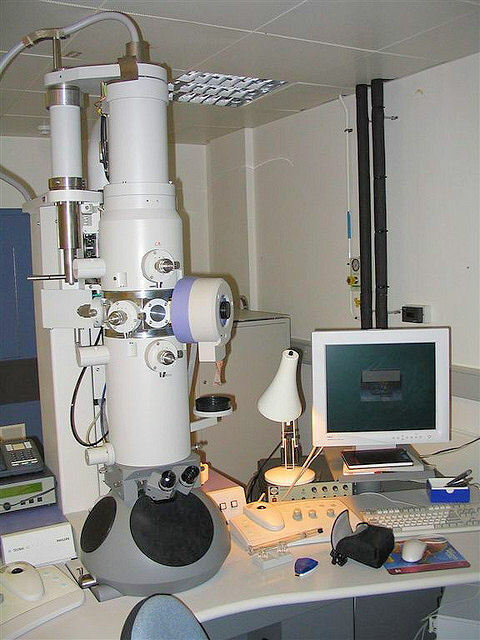 The more traditional form is the transmission electron microscope (TEM). To use this instrument, ultra-thin slices of microorganisms or viruses are placed on a wire grid and then stained with gold or palladium before viewing, to create contrast. The densely coated parts of the specimen deflect the electron beam and both dark and light areas show up on the image. TEM can project images in a much higher resolution—up to the atomic level of thinner objects. The second and most contemporary form is the scanning electron microscope (SEM). It allows the visualization of microorganisms in three dimensions as the electrons are reflected when passed over the specimen. The same gold or palladium staining is employed. observe individual viruses and macromolecular complexes in their natural biological context. Sample preparation can be critical to generate a successful image because the choice of reagents and methods used to process a sample largely depends on the nature of the sample and the analysis required. A beam of electrons, instead of light, is used with an electron microscope. Electron microscopes have a greater magnification because the wavelengths of electrons are much smaller than those of visible light (0.005nm as opposed to 500nm respectively–one hundred thousand times smaller). There are two types of electron microscopes, scanning and transmission. The best compound light microscopes can magnify 2000x, electron microscopes can magnify up to 100,000x. electron beam: a stream of electrons observed in vacuum tubes.